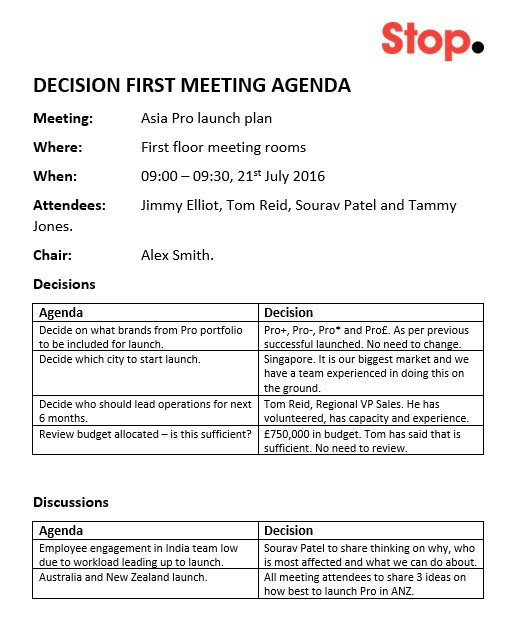 What is the process for decision-first meetings? If you were to ask your leaders and managers to analyse how they spend their working days, the single biggest time commitment would likely be internal meetings. Most of us can identify with that, and have heard some of the scary stats. Most research suggests that managers spend anywhere between 30% and 60% of their time in meetings; our experience shows 30% – 40% to be typical. Depressingly, many of those meetings are deeply ineffective and some totally unnecessary. Do the maths and you quickly realise meetings are incredibly expensive. Why then is there so little innovation on how to run meetings? In the right place, technology tools such as Slack and Trello have improved collaboration and will continue to do so. But fundamentally, the way meetings themselves work has not evolved. There is an alternative approach. It’s called decision-first meeting. Here is how it works. 01. Standard agenda. It starts with a simple meeting agenda developed by the meeting owner. No prizes for originality here, but more organisations than you’d believe still fail on the basics. 02. The simple difference. In a column next to each agenda item, the Chair of the meeting includes a recommended decision. For any agenda items for discussion only, the Chair lists actions to support a productive discussion. 03. Pre-read sent 2 days before meeting. The Chair sends the decision-first agenda to all meeting attendees 48 hours before the meeting. Attendees are encouraged to gather any information they need in advance of the meeting. 04. Meeting objective. The Chair makes the purpose of the meeting completely clear. It is basic, yet many organisations become sloppy at basic meeting hygiene. Staff at the University of Berkley start every meeting with: “The purpose of this meeting is to inform you about X, to discuss Y and to decide on Z”. 05. Decision first. The Chair moves through the agenda one item at a time. For each item, the Chair asks attendees if they agree with the decision shared in the pre-read. If everyone agrees, there is no need to discuss that particular item in detail and the meeting moves on to the next item. It should be stressed that whilst the meeting is deliberately pacey, it is not recklessly rushed. The Chair retains a duty to make sure that every item is covered appropriately. But significant time is saved from not spending time discussing what everyone already agrees on. 06. The close. As with all good meetings, there is a consistent process for closing. The Chair reaffirms the decisions taken and next steps agreed. Decision-first meetings ensure timely, important decisions are made. It is not to say discussions without immediate decisions aren’t useful, but it is critical to make sure those discussions are labelled appropriately to avoid every meeting becoming a talking shop. Takeaway: If you feel that meetings in your organisation are not as effective as they could be, we highly recommend giving decision-first agendas a try. It’s free and easy to implement. And most meeting attendees appreciate the pace and structure it provides.